Thats awesome!!! When you make the final table let them use some make up on you otherwise youll glow! Sending you run good wishes for day 2. The casino staff did NOT do a random redraw. They took 1/2's of 2 tables from a flight and combined them (had Chainsaw at my table due to it for a min or 2). They also took 10 of the top 15 stacks and put them all at the same table and another where seat 1 had the most chips, on down to seat 10. What a %*)(#*'d up joke! After a player revolt, the HPT guys over-ruled the casino idiots and FORCED a total 100% random redraw... then the fiasco started about the casino chips... gonna make for an interesting blog writing it tonight. Busted in the first level. 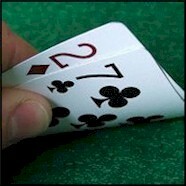 Nada the first orbit (no aces) and only realistic hand was KT.. but not with, raise, 3-bet, 4-bet shove in front of me. Had a std open at the end of the 2nd orbit, I looked down at AJs and shipped... guy had AQ and the Q played. Good run sir, not only in the tourny but to get there.